HTML5 has been the hottest buzzword in the internet industry for the last couple of years and for a good reason. You might not know what HTML5 exactly stands for, but if you enjoy Google’s doodles or Pandora’s internet radio, you probably already experienced its magic. But where did HTML5 come from? And how did it evolve from a basically good idea into the web standard it is today? Get those answers and more in this groovy infographic. by Wix.com. Browse more Technology infographics. 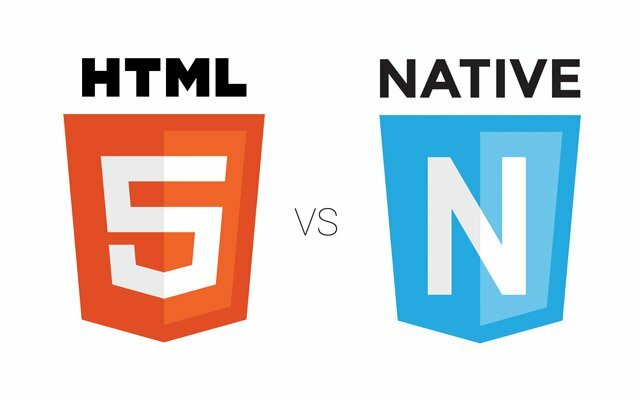 HTML5 vs Native Apps: What’s best for 2016? The mobile ecosystem has, and continues to witness a radical change. With continuous development of new mobile devices and operating systems, business organizations and enterprises are under extreme pressure from their users and employees to build apps that aren’t just helping in accommodating mobile work styles but also boost customer engagement. While the support that HTML5 provides for mobile apps is improving very quickly, on the other hand, (native) mobile apps helps deliver an optimal user experience (UX). In order to determine which one of the two offerings will help you meet the growing needs of mobility, I’ve covered a few concerns that will help you in making the right choice. As the mobile device usage continues to increase than the use of desktop computers, the day is soon coming, when desktop computers will be used only by veterans and laggards of the technology adoption life cycle – everyone else will use nothing else than a mobile device, to an extent. There’s a wrong perception about going mobile. Possibly, some of you running any bricks and mortar business might believe that mobile isn’t important for your industry. But, keep in mind that mobile have a profound effect on anyone who is associated with selling something. For instance, if you own a restaurant, mobile is what guides people in finding the location of your restaurant and even can help them decide what to eat. Today, almost every individual use a mobile device (ideally a Smartphone) does everything, but if they can’t work on something on their mobile phone they easily become frustrated, and move to the first offering that helps meet their needs. Wondering what you should do? Well, you need to understand that mobile is not just about having a responsive website. As more and more users prefer browsing websites from small screen mobile phones, a responsive site might not be able to deliver your content quickly to a wider mobile audience. That’s not to say that you should ignore creating a responsive website, but building a web app or native apps proves a viable option in making your website content accessible to a large mobile audience at a blazing fast speed. Besides, it also provides the functionality of touch-enabled devices. However, to decide on building a HTML5 web app or a native app, you’ll first have to understand the habits of your target audience to manage your business efficiently via mobile devices. Understanding customers is key to building a successful mobile solution. Basically, it is important to understand how your customers are using or will want to use their mobile device to interact with you. And only after analyzing what their needs, you can come up with a solution that could address the continuously changing demands of mobile users. 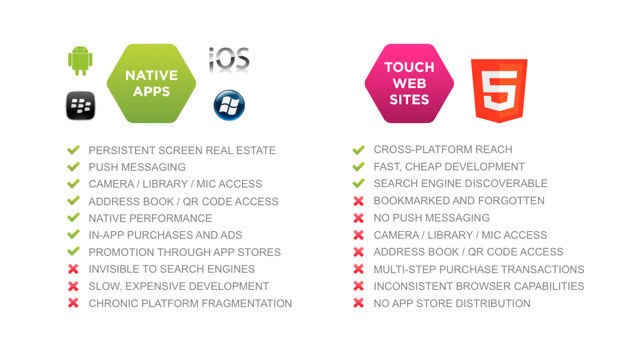 Mobile Apps vs HTML5 Web Apps: Which One to Choose? 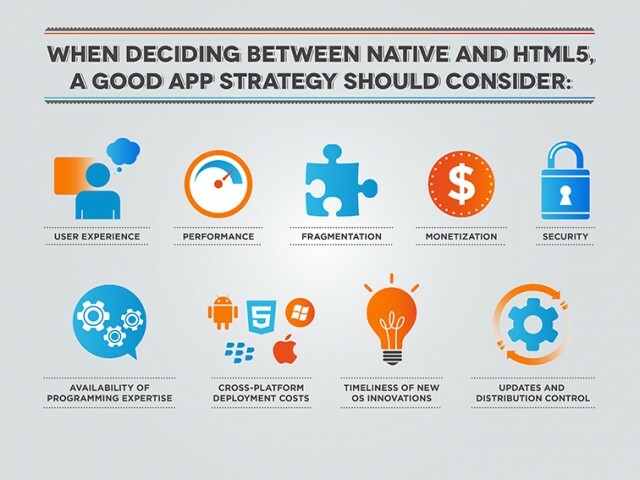 For the last few years, web and app developers have been battling over whether to choose building an HTML5 web app or a native mobile application. Some declare the debate over. The majority of mobile app developers prioritizes HTML5 for building apps, because of the ease and speed in building and updating the apps, using a single codebase. At the same time, the native apps advocates argue that building apps for each operating system individually help in making the apps better in terms of looks and functions, when compared to its browser-based equivalents. However, there are issues with both HTML5 as well as native apps.With ever-increasing number of devices and operating systems, creating different versions of native apps available for each new device or an OS can be an overwhelming and challenging job. On the other hand, HTML5 fails to cope up with the expectations of building apps with offline capabilities and animation tools. In a nutshell, while HTML5 helps build highly engaging mobile apps quickly, it does not provide any unique functions that help deliver users with expected mobile experience. In contrary, native apps enable users to make use of mobile functionalities, but developing a native application can be troublesome when you’re targeting multiple devices. Mobility is influencing strategies, used by organizations and enterprise architectures, to gain competitive advantage. And, with the (inescapable) rise of ‘Bring Your Own Device’ or BYOD trend,most of the enterprises are looking out for ways to support multiple platforms. More importantly, enterprises are considering to leverage mobile apps around many different platforms. However, as users’ interests in accessing the capabilities of mobile devices (like location information, mapping capabilities, etc.) are building up, the need for context awareness in apps has augmented. 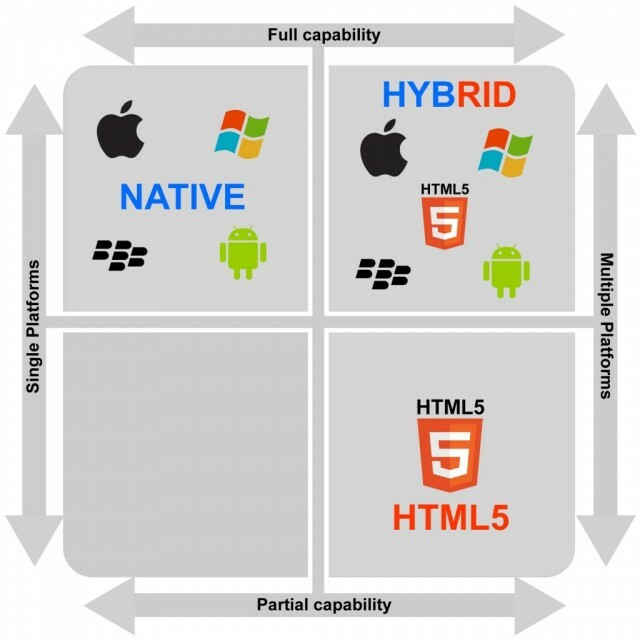 This has compelled developers to consider hybrid as well as native architectures for building mobile apps. As a result, enterprise developers are looking for alternatives to web applications. Essentially, enterprises need to build mobile apps that could span all major architectures, and come bundled with native device capabilities. Such an objective can be achieved with the help of a hybrid app. It is an HTML5 based web app that is wrapped in a native container using mobile app development platforms such as Cordova. This means that hybrid apps are just like any native application that comes embedded with a browser in it. Furthermore, HTML5 will become the standard tool for developing mobile applications.